The Grey Mountains are a playground for Morgoth's drakes, and as such they're an endless source of adventure for fools, the mega-experienced, or vengeful dwarves wanting to take back what's theirs and retire fifty times over. I suppose you could say that dungeons and dragons are what the module is literally about, though if we're magnanimous, "dungeons and dwarves" is more respectful of rightful claims. Regretfully, I never got to use this beast, as it was published in the '90s when I was hardly gaming anymore. But I remember wanting to play it very badly. The dragons of Middle-Earth are twice as lethal as those of classic D&D, and fall into six breeds which I prefer over the rainbow kinds (yes, Dragonlance, I'm looking at you): cold-drakes, fire-drakes, ice-drakes, cave-drakes, marsh-drakes, and rain-drakes; and there are winged variations of the cold- and fire-, able to create local hurricanes just by stirring the air as they fly. The module provides stats and bios for 28 of them, including really nasty brutes like Scatha, Smaug, Ando-anca, Itangast, Throkmaw, and Uruial. And if this menagerie isn't enough, there are also ice orcs, of all things, terrorizing the northern range with a priest-cult more terrifying than its military. Then there are the dwarves. 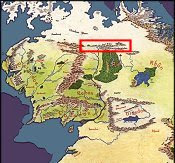 The module can't seem to decide whether it's situated in the year 1640 or 2589, but of course it's only during later times (2210-2589) that dwarves lived here until crushed by the cold-drake Ando-anca and forced to return to Erebor. There's a real feeling of suspense conveyed by the Norr-dum setting and the splintered society under Dain I, as its about to replicate the tragedy of Durin VI in its final hours. And while the Balrog horror is far more epic than that of Ando-anca, The Grey Mountains is a surprisingly better module than Moria. The mapwork is generally in top form. In addition to the detachable color map, detailed layouts are provided of Norr-dum (the dwarven capital from 2210-2589), Kala Dulakurth (the ice-orc palace present throughout all of the Third Age), and Celeb-ost (the dwarven smithy founded by the renegade Narvi V in 2086, who went insane and massacred his own colony, and whose ghost haunts the ruins after 2110). The nice thing about dwarves is they're such treasure-mongers that their halls serve as opportunistic dungeons in the classic sense, which of course they become anyway when the drakes drive them out. Two particular dragon lairs are laid out, with treasure and magic items out of a Monty-Haul campaign. Way too much attention is given to the Northmen town of Buhr Thurasig, which ceases to exist by the end of the 1600s, but which for some reason is used as the basis for three adventure scenarios. 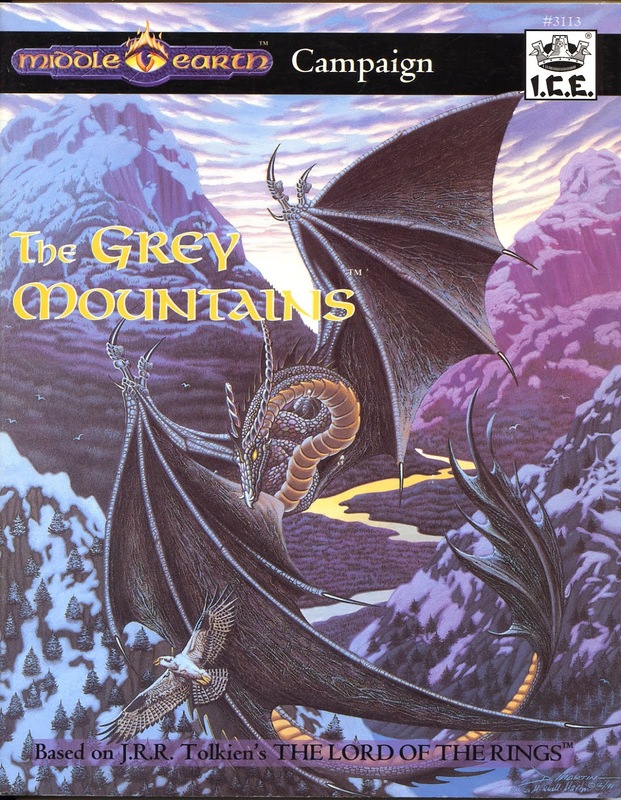 On whole The Grey Mountains stands as one of the better campaign products of the '90s, and I wish I'd gotten to use it. Agreed! I loved this module and I never got to play it, but it would have been awesome, I'm sure. On the good side, it gave me great ideas about adventures for other games and stories. Probably one of the best and more evocative modules from ICE.